Home » The Seedling BLOG » Talking about Mud! Let’s Talk about Mud & Mud Kitchens! Welcome and hello! 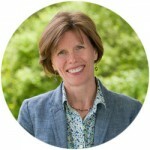 Today I will be answering the most frequently asked questions that I receive from teachers and parents about dirt, mud, and Mud Kitchens. Enjoy! How do you work with programs that have outdoor space challenges? The way I look at it is accepting that every outdoor space is completely different. Some programs have lot’s of green space and land, while others only have a black top or rubber landscape with a huge climber. This is not my focus. My focus is on what is the same. What are the elements that we can add to these spaces that are easy and have the most impact on child development? Mud Kitchens are ideal for this. They can be made from up-cycled materials and they too, come in all shapes and sizes. They can be small and simple or large and elaborate. No matter what your space challenge, adding a mud kitchen is possible. What is a Mud Kitchen? 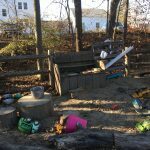 Mud Kitchens, also known as an outdoor kitchen or mud pie kitchen and is one of the best resources for little ones to play outside as kids playhouse. Mud kitchens are a very popular playground resource for nursery schools because they are very cross-curricular, meaning that they can be used to reach many learning objectives from the Early childhood curriculum. Mud kitchens provide great outdoor learning spaces for young children and come in all shapes and sizes. A change of clothes for children = freedom to get dirty! Why add water and water walls? First, water and dirt make MUD! So it’s important to have easy access to the water. Depending on your comfort level and how much you want the children to get dirty on any given day, you can control how much water the children can use. Adding a water wall near the Mud Kitchen is a no-brainer. Leaving loose parts around for the children to create their own water walls is ideal. There is so much to explore and an incredible amount of open-ended learning that happens. Invite the children to explore how to get the water into the Mud Kitchen. The possibilities are endless. Why is storage so important? 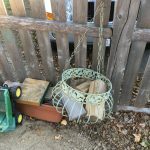 I am always asked about the best storage ideas for the Mud Kitchen. The first rule is, if you are keeping your pots, pans and kitchen materials outdoors, make sure you store them in something that has holes. This is important for the water to filter out when it rains. Nothing worse than a bucket full of pots and pans soaking in rainwater. Look for crates, barrels, and baskets. Labeling your storage containers is a great way to add Literacy to your outdoor space. Did you enjoy this little question and answer post? Want to learn more about Mud Kitchen? 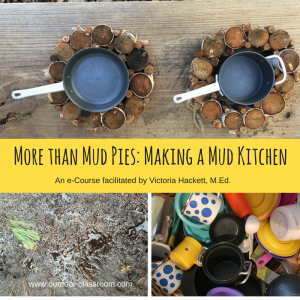 Check out the More than Mud Pies: Making a Mud Kitchen e-Course. Have any additional questions about dirt, mud and Mud Kitchens? Write them in the comments below. This is awesome ! I actually went to a thrift shop last week and purchassed baskets, pots and pans, muffin and cake pan and all kinds of second hand items that I’m going to put in my mud kitchen. It doesn’t exist as we speak since winter is still hitting us pretty hard here but I have plans to make a mud kitchen for my daughter as soon as the weather will cooperate 🙂 What is a water wall ? How could I build one ? Could I see a picture of one if you have one ? Love all the ideas here and all the good tips ! Perfect! That is exactly what you want to do! 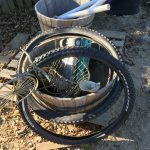 Start collecting materials now for your spring projects. Spring will be here before you know it and it is exciting to get the energy around creating a Mud Kitchen! Water Walls use loose parts too. The most popular way to make a water wall is to attach manufactured loose parts to a fence. You need access to water. The idea is for the water to go through the obstacles (loose parts). You can make it for the young kids or older kids can make it. I will write up a post about this with pictures.